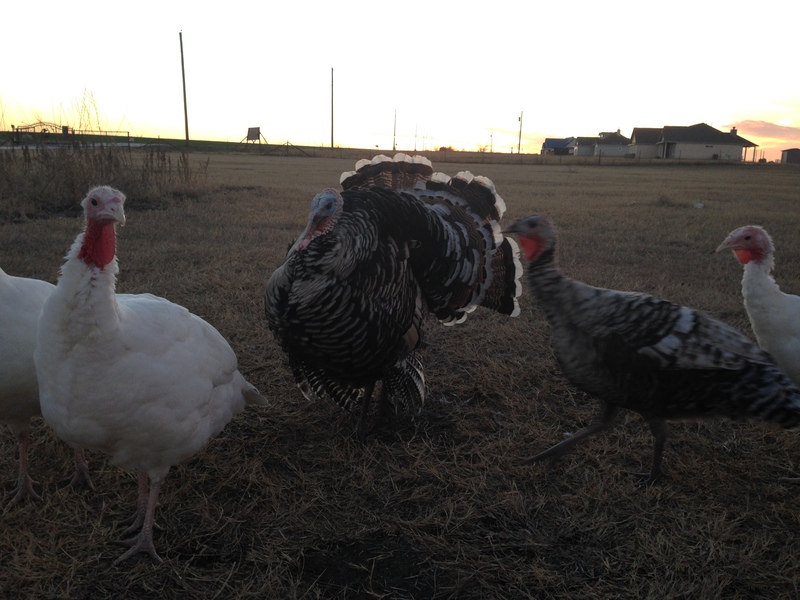 Our Narragansett Tom and one his 2 lady friends, and some Midget White Turkeys hanging out on the homestead. We purchased some Narragansett (I will never pronounce or remember this word, so I usually go with “the brown ones” lol) and Midget White Turkeys earlier this year form McMurray Hatchery online. They were backordered (yes, you can back order turkeys…although the saying goes don’t count your chickens or turkeys before they hatch!) and we received them in August. They were probably 1-3 weeks old (called Poults) and we had about 15 total. Around 3 died after we received them, which is normal when you ship poultry in our experience. You can usually expect this to happen within the first 3 days of receiving them. This is why I prefer to use local stores to buy poultry if I have to, but this is what we are trying to get away from! By Christmas, we were able to slaughter a Midget White and had about 6 pounds of meat, which fed 5 people with leftovers (not as much as I used to have but really, who can eat turkey for 2 weeks?!). Positives: First off, this was the best Turkey I have ever eaten! Secondly, these are great for families who want to homestead without a ton of feed cost. They stay small so you are not going through as much feed. Third, they are friendly. Each breed runs to greet us when we come home from somewhere. 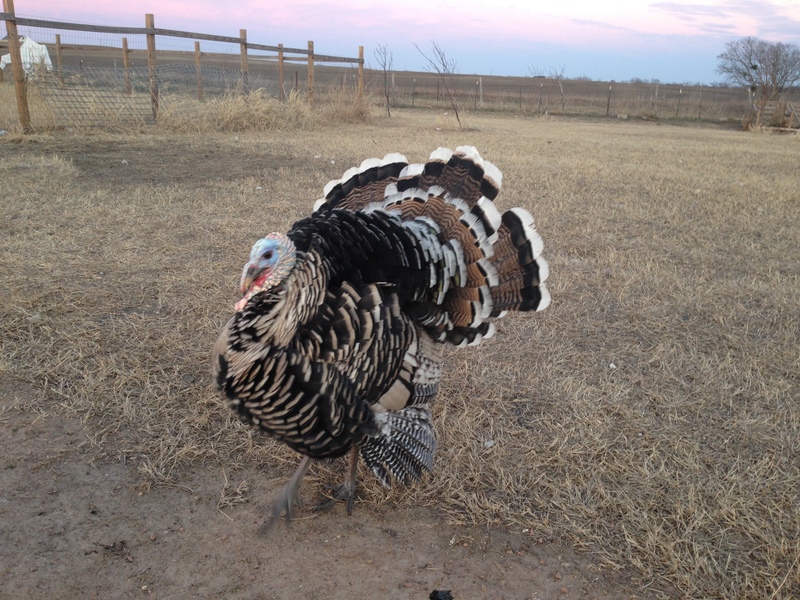 You hear them “turk turk” and “gobble” as they run/fly to you! It is always funny and I feel like Noah or some type of Ace Ventura Pet Owner :). We are now down to 3 Whites and 3 Narragansetts. We wanted to have one Tom from each and two Hens from each, so to continue breeding and developing a sustainable turkey production. Unfortunately, I don’t believe and of the Whites were Males, so we have 3 females that we plan on processing in the next few months. It stinks b/c we had to order a Straight Run (mix of males and females) so there is no guarantee what you get. So, we are currently waiting to find some turkey eggs, which should be soon! And at that point we will incubate some to start our Narragansett heritage lines! If you follow the blog, you will noteice a reasonable size difference from these breeds and the Broadbreasted Whites we had this past Summer. I could barely fit those in my oven! Actually, it didn’t, I had to give Hubby Crab the legs to grill on the outside propane because they wouldn’t fit! They were each about 28-30 pounds after processing (we took the skin off too) and preserved/cooked very nicely! But, they were way too expensive to keep feeding! I hope this review helped anyone looking into adding Turkeys to their homestead. Please contact me with any questions! Great pictures, especially your first one! Thanks for sharing.